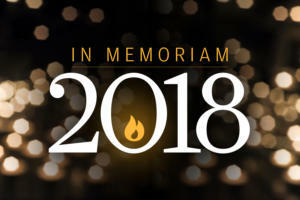 It's been more than 30 years since the arrival of Apple’s Macintosh computer -- the Mac -- which has evolved substantially, especially over the past decade. (And as of today, it's been 20 years since the first iMac was unveiled.) From only 128KB of memory in the first Mac (to an optional 128GB in the latest iMac Pro), Apple has continually redefined its products from design and aesthetics to functionality and productivity. 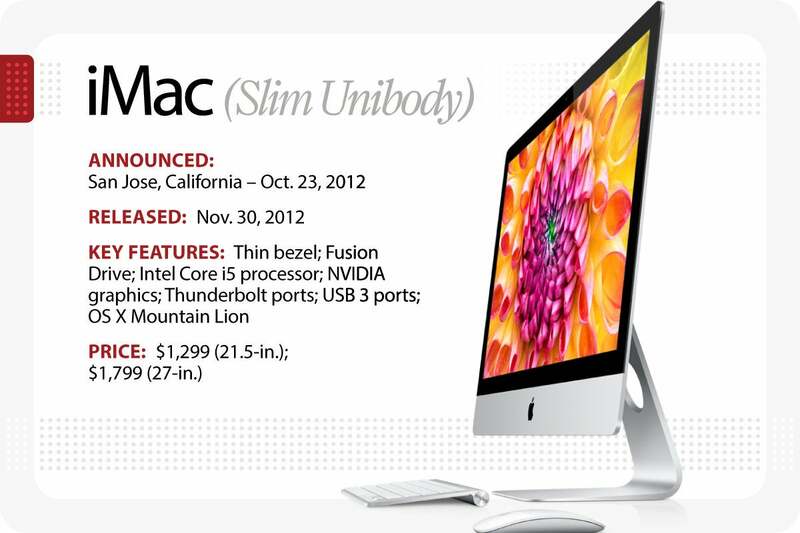 The Mac now accounts for 7.5% of the declining PC market, with sales continuing to outperform sales of Windows PCs. 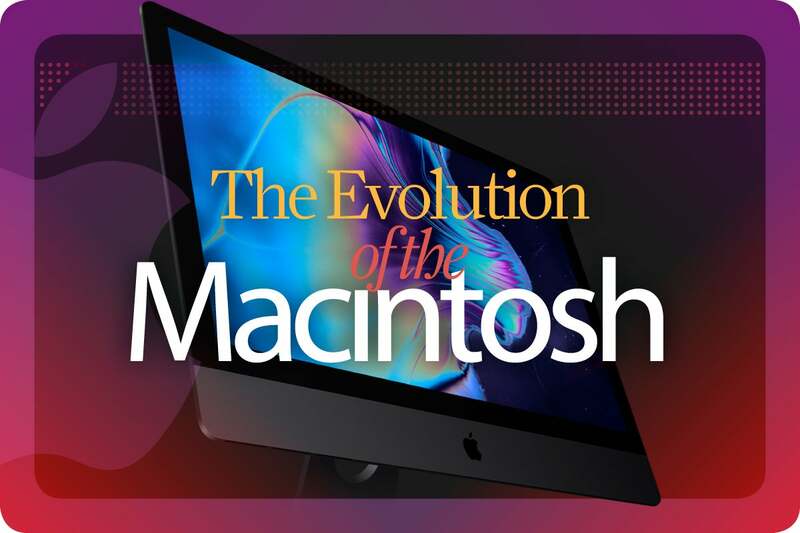 Here we take a look at the Mac’s evolution throughout the past three decades, with a focus on the rapid changes of the last decade or so, especially as the iMac grew and evolved beyond its original gumdrop design. The original Macintosh went on sale two days after Apple's critically acclaimed 1984 ad aired during the third quarter of Super Bowl XVIII. 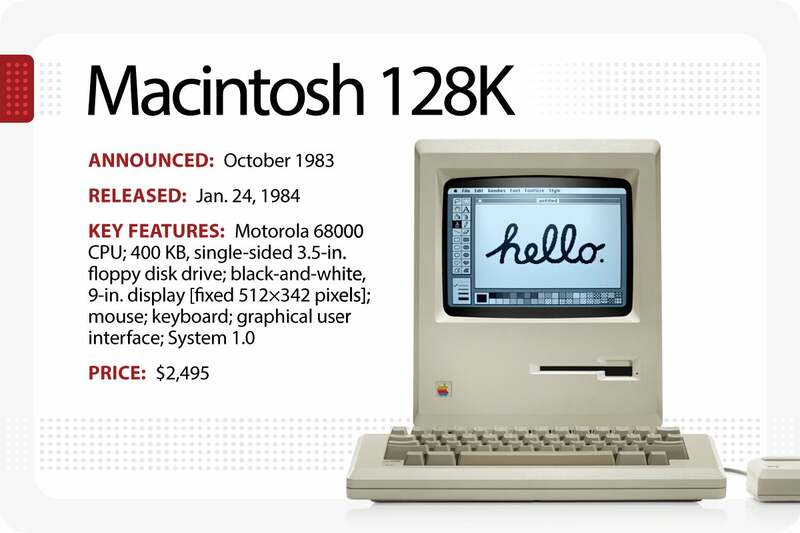 Apple’s Macintosh 128K aimed to fundamentally change how consumers viewed computers and make them more affordable, personal and commonplace. 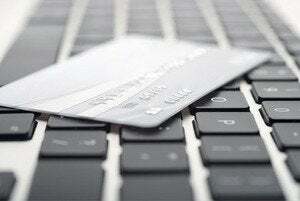 It used a Motorola 68000 microprocessor, 128KB of RAM and a 400KB 3.5-inch floppy disk drive. The Mac’s OS, known as System 1.0, introduced the Finder that is still used today. Apple's Performa sold mainly through authorized retailers in department stores throughout the mid-1990s. 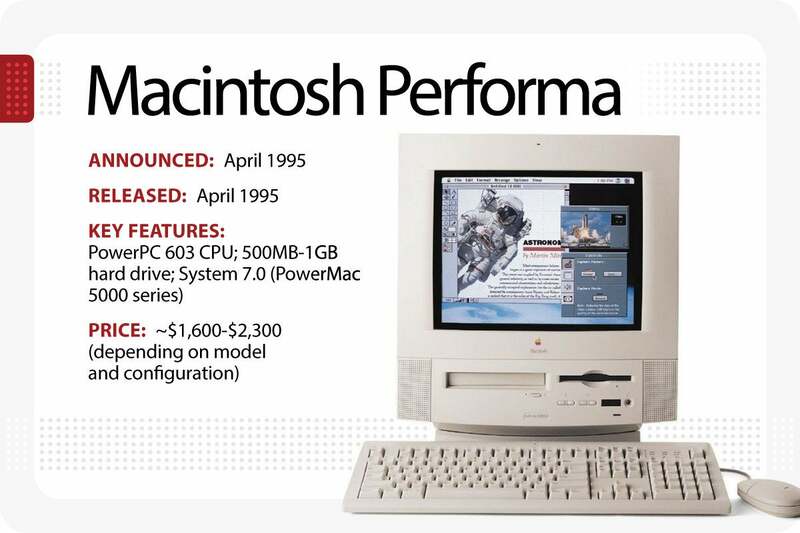 Although not a new model, the Performa was a rebranding of then-existing Mac models, including the Classic, Quadra, Centris, LC, and Power Macintosh, and was meant for everyday users. 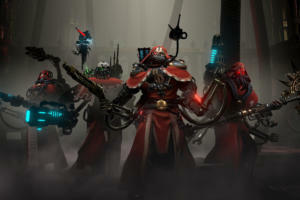 The marketing tactic backfired, however, as the large number of models (in addition to those for business) competed with one another, and created customer confusion. The Performa line was also criticized for its lack of power and hardware design. 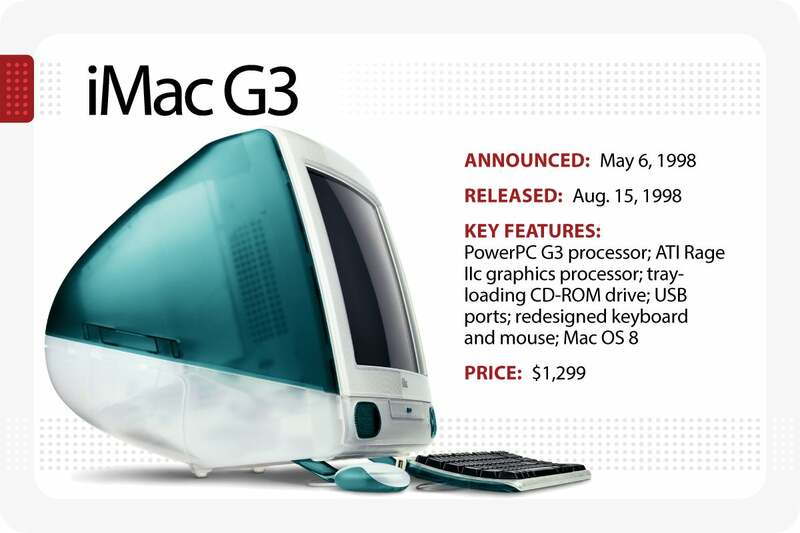 Apple finally nixed it in the late 1990s and simplified its products by offering a desktop and laptop for both the professional market (Power Macintosh G3 and PowerBook) and for consumers (iMac and iBook). After Steve Jobs’ return as CEO, Apple’s futuristic and design-conscious concept, dubbed the iMac G3, brought the company back from financial hardship. Built using a translucent “Bondi Blue” plastic, it featured a 15-inch CRT display, a PowerPC G3 processor, an ATI Rage IIc graphics processor, a 4GB hard drive, a tray-loading CD-ROM drive that replaced the traditional floppy disk drive, USB ports (to much criticism), an infrared port, built-in stereo speakers, two headphone ports, a redesigned keyboard and mouse, and Mac OS 8. The iMac G3 became a cultural phenomenon and had several iterations and upgrades over the next few years (including a slimmer model). 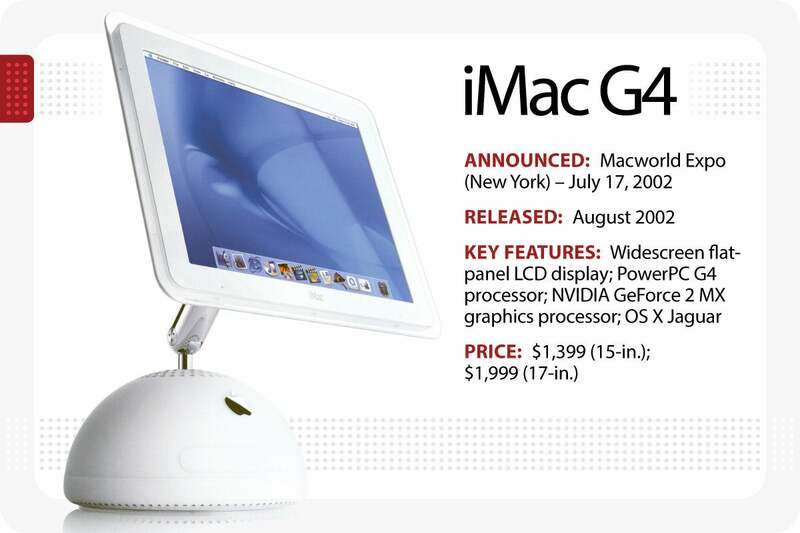 Designed around an ultra-compact base, the iMac G4’s one-inch thin flat-panel display appeared to float in mid-air, allowing users to adjust its height or angle with just a touch. This was a big deal, since PCs (and earlier iMacs) still used outdated, clunky CRT displays. 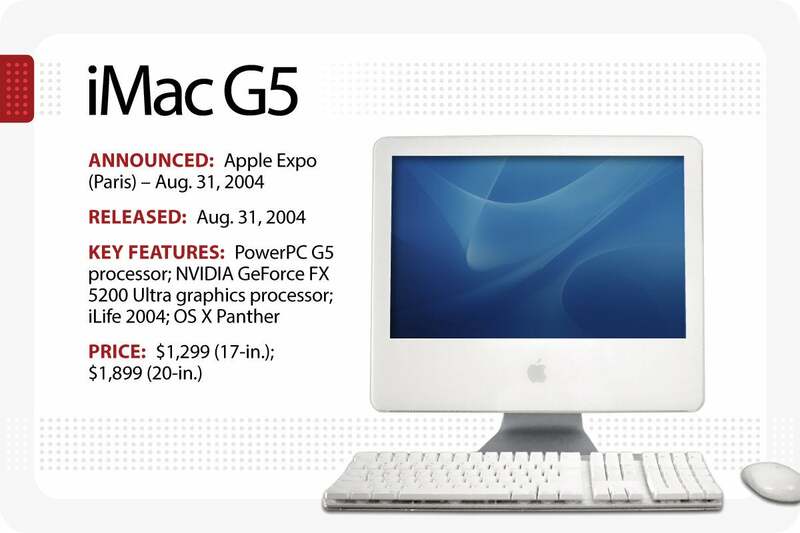 The all-in-one machine used a PowerPC G4 processor, an NVIDIA GeForce 2MX graphics processor and ran OS X Jaguar. Inspired by the iPod, Apple unveiled its polycarbonate white iMac G5 at the Apple Expo in Paris. The display was suspended from its anodized aluminum stand, making for a very small footprint, and unlike its predecessor, the entire computer was integrated into the flat-panel display. Just two inches thick, Apple dubbed it the world’s thinnest desktop computer. It included a built-in SuperDrive, a PowerPC G5 processor, an NVIDIA GeForce FX 5200 Ultra graphics processor, iLife 2004 and OS X Panther. 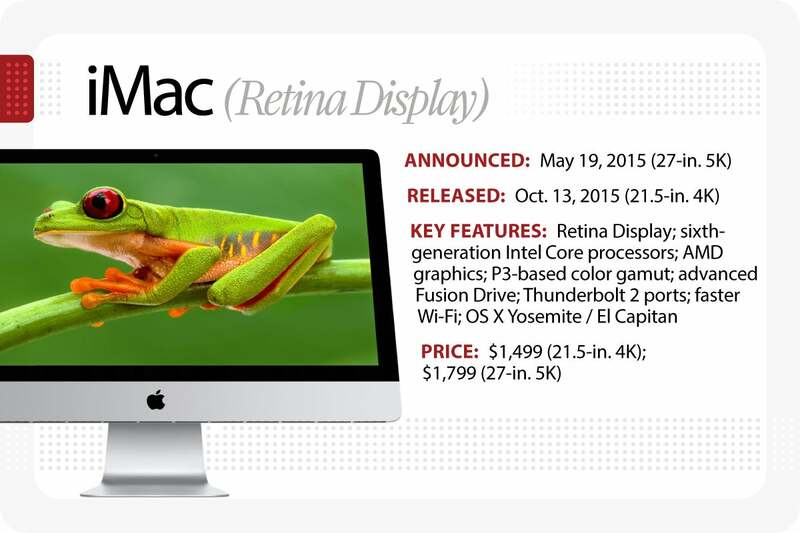 Apple changed the game with an updated iMac that used, for the first time, Intel processors. 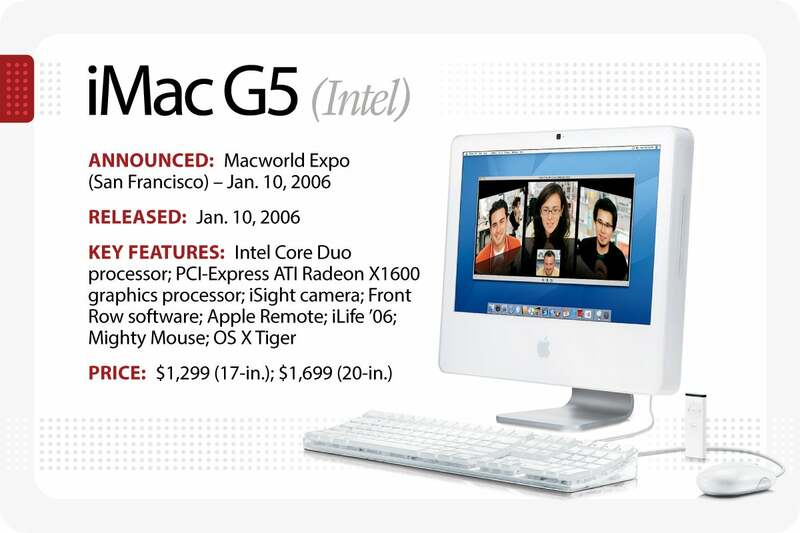 As Apple noted, it forged “a historic partnership between the world’s leading chip innovator and the world’s most innovative computer company.” The thinner and lighter G5 included an ATI Radeon X1600 graphics processor, an iSight camera for video chats, Front Row entertainment software with a Remote for viewing slideshows and movies, iLife ’06, an updated Mighty Mouse and OS X Tiger. Apple’s next major redesigned iMac melded glass and aluminum for a more contemporary look that stuck as a placeholder for its successors. It sported Intel Core 2 Duo processors, an ATI Radeon HD 2600 PRO graphics processor, a glossy widescreen display, iLife ’08 and OS X Tiger. Apple also included its redesigned keyboard, Mighty Mouse and Apple Remote. 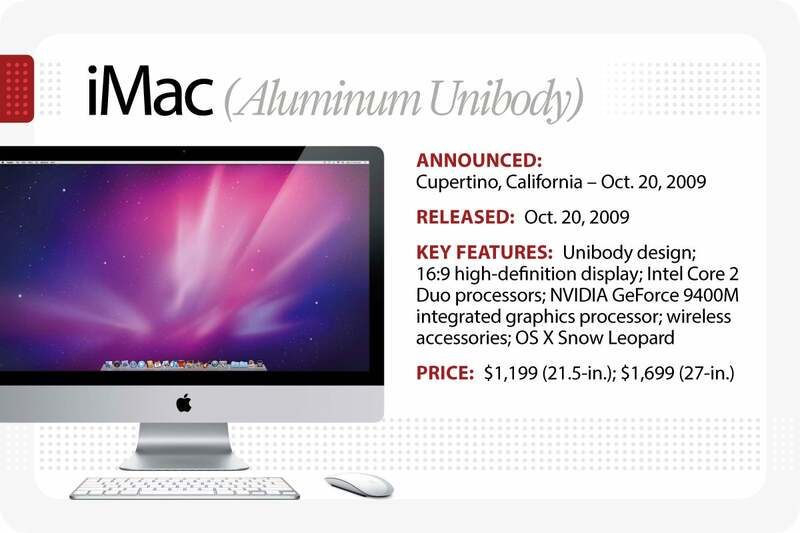 This aluminum model was notable for its unibody design and 16:9 high-definition display. 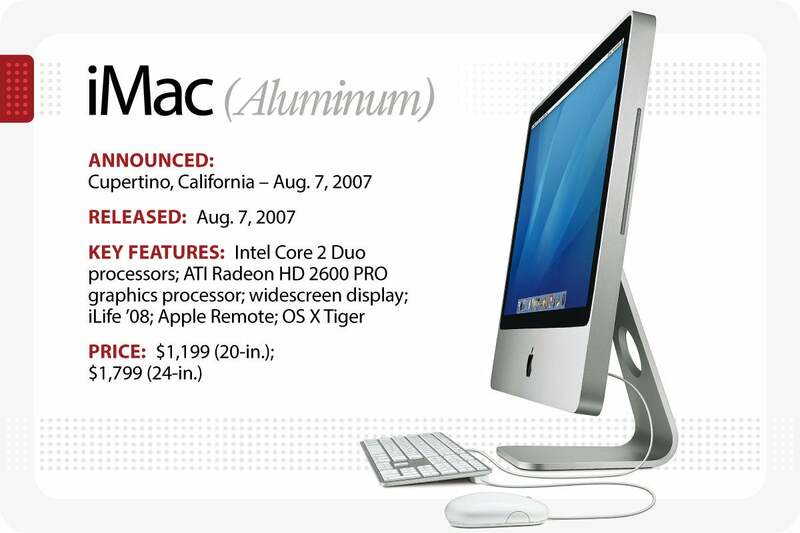 Unlike the previous generation, the iMac’s screen was edge-to-edge glass. It included Intel Core 2 Duo processors with a NVIDIA GeForce 9400M integrated graphics processor and shipped with OS X Snow Leopard. Additionally, Apple included its new wireless accessories: an Apple Keyboard and a Magic Mouse. Apple released its thinnest iMac (with a 5mm edge), taking up as much as 40% less volume than the previous generation and featuring a new Fusion Drive – a storage option that combined a high-capacity hard drive with high-performance flash storage. It included third-generation, quad-core Intel Core i5 processors, the latest NVIDIA graphics, Thunderbolt ports, new storage options, USB 3 ports and OS X Mountain Lion. It also used 50% less energy at idle with the display on than previous models. Because of its radically thin design, this iMac also banished the SuperDrive in favor of its digital hub via iTunes and the App Store. Apple released its first iMac with Retina display three years after the hi-def screens first appeared in its MacBook Pro line. With 14.7 million pixels, the 5120x2880-pixel resolution had four times as many pixels as its predecessor. 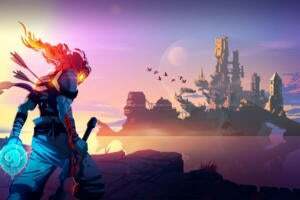 It included sixth-generation Intel Core processors, the latest AMD graphics, a wider P3-based color gamut, an advanced Fusion Drive, Thunderbolt 2 ports and faster Wi-Fi. This generation also incorporated an advanced timing controller that had four times the bandwidth of the previous model and included OS X Yosemite. The 21.5-in. 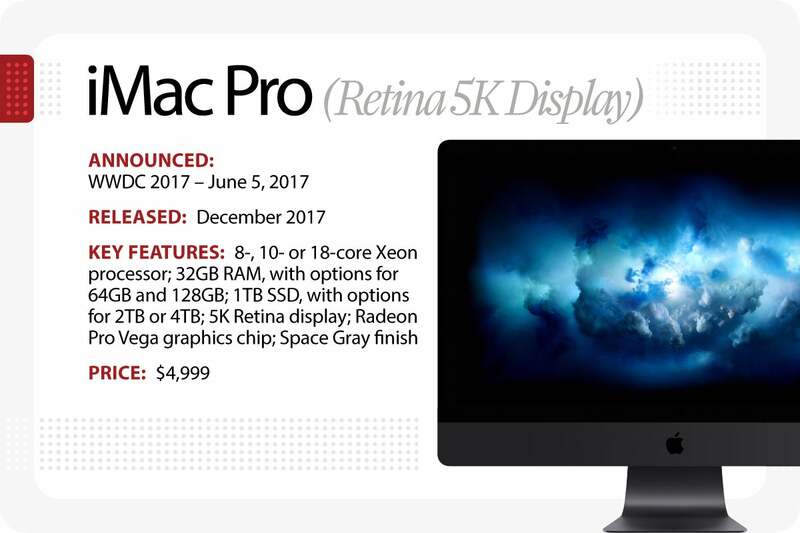 Retina 4K display was introduced a few months later, along with OS X El Capitan and new desktop accessories: the new Magic Keyboard, Magic Mouse 2 and Magic Trackpad 2 -- all of which were redesigned with internal batteries that could be recharged with a lightning cable.